Preparation & Implementation training is designed for education administrators and lead staff (decision-making stakeholders) interested in preparing for and implementing Check & Connect. Note that this training is not intended for Check & Connect mentors. Exploring this student engagement intervention. Preparing to implement the program. Currently implementing and seeking formal training. Pursuing training for leadership teams of 10 or less. Training for leadership teams unable to attend in-person. On-site Preparation & Implementation training is also available. The cost for on-site training is determined based on number of participants. To request on-site training, please complete the Training Inquiry form or contact us at 1-866-434-0010 or by email at checkandconnect@umn.edu. One set of training materials and Certificate of Attendance provided per participant. The training will be delivered through Zoom, an interactive online training platform. Participants will not be using video or a webcam from their computer, while participatation using your computer microphone will be optional. The training link will be emailed to participants closer to the training date. Refunds will not be available for cancellations made on or after the registration deadline. We reserve the right to cancel this event if we do not meet our minimum of registered participants by the registration deadline. We will notify any registered participants via email or phone within 2 business days following the registration deadline if this event is cancelled. Maximum of 12 participants per training. Additional requests will be placed on a waiting list. Register early as space is limited and registrations are taken on a first-come, first-served basis. We accept payments by credit card and purchase order. If paying by purchase order, see instructions below. Group registration is required for groups of 3+ to receive the 15% discount. DO NOT send payment until you receive an invoice voucher from the University of Minnesota in the mail. Obtain PO number and billing contact information prior to registering. Make PO payable to The Regents of the University of Minnesota, with the payment address of: Regents of the University of Minnesota, NW 5960, PO Box 1450, Minneapolis MN 55485-5960. If your organization is tax exempt, include your tax-exempt ID when registering and a copy of the exemption certificate with your materials. Upon registration, you must email or fax your registration confirmation with a PO (and tax exempt certificate, if applicable) to: Melissa Critchley, checkandconnect@umn.edu, 612-624-9344 (fax). "The training really helped the participants to solidify and understand the importance of determining specific criteria for student selection when implementing the model. The technical assistance was very beneficial and provided an opportunity to discuss actual cases and to receive feedback regarding model fidelity." 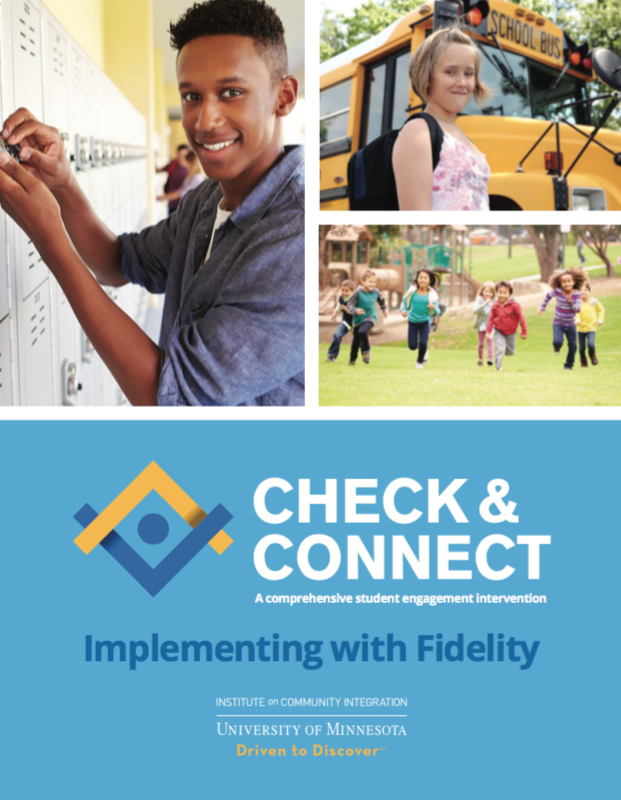 Preview and order this comprehensive guide to implementing Check & Connect. Bulk discounts available. The top banner photographs used on this website are for illustration purposes only.